The economic downturn led me to prison. In 2008, facing unemployment for the second time in my decade of work within the struggling fabric industry, I made a decision to change direction. Knowing a sense of physical involvement and accomplishment was a priority for me, I turned to gardening. Alcatraz was the prison that became my salvation. I began the Environmental Horticulture program at City College of San Francisco to gain experience needed to become a professional gardener. In my first plant ID class, instructor Charmain Giuliani required a presentation or garden volunteering. Intrigued by a poster calling for volunteers in the Alcatraz gardens, and with Charmain’s encouragement, I looked into it. Just two weeks into my gardening voyage I began work on The Rock. I loved it! I ended up volunteering and doing a class presentation. I’ve been speaking on behalf of the Alcatraz gardens ever since. 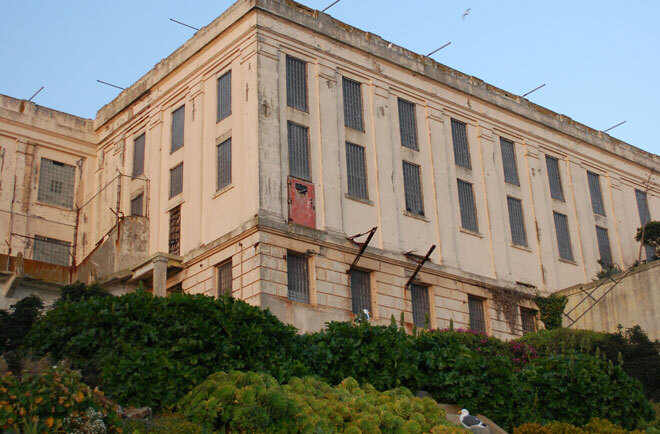 The Garden Conservancy, together with the Golden Gate National Parks Conservancy (GGNPC) and the National Park Service, is restoring the Gardens of Alcatraz after 40 years of abandonment. There is so much to discover. As overgrowth is cleared, irises, roses, and geraniums–plants that have survived with no water other than rain and fog—pop up. I completely relate to these tough survivors. It is so therapeutic to be surrounded by water, working alone with pruners and a trowel in the morning fog. 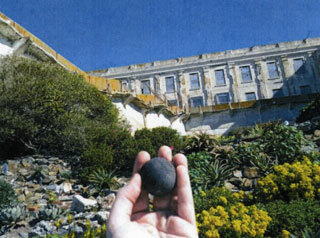 Few Alcatraz prisoners actually gardened, but those who did spoke of its salvation. Here I was getting to revive the very plants that nobody since those prisoners had tended. When I’m out there gardening, I am one survivor helping another. My first day working along the main road, tourists passed by, astonished by the gardens. I signed on as one of the first docents when tours of the Alcatraz gardens began. Leading tours, answering questions, and sharing information about work on the gardens is literally my favorite thing I have ever done. Docents use giant laminated historic photos for reference as we take groups around, telling stories about the gardens’ roles in the lives of prisoners and families on the island throughout its occupation. The restoration has been no small feat and it’s moving to see the volunteers’ accomplishments. Volunteering for the Gardens of Alcatraz is rewarding beyond my expectations. Originally a place for me to gain gardening experience, the joy of restoring these gardens has led to a real desire to see them thrive. Along with the friendships developed there, gardening has become a personal project that I miss when I can’t attend. Recently, I helped restore a collapsed historic retaining wall. I found the discovery of a prisoner artifact—a simple handball lobbed over the wall some fifty years ago, exhilarating and inspired me to take an archaeology class. Specialized GGNPC Parks Academy seminars have raised my gardening ecological awareness, and I continue to educate myself on that topic. Today I volunteer as often as possible within limitations of my nursery job, garden clients, and school. While not currently leading tours, I remain a docent. 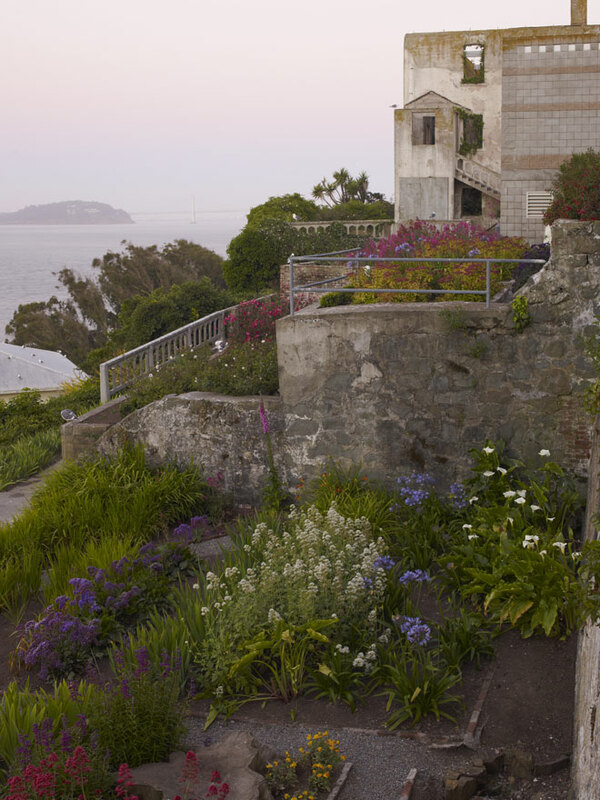 I attend public events on behalf of the Gardens of Alcatraz, give presentations to Charmain’s classes, and I write a gardening blog with a category for my Alcatraz Gardens experiences. I’m pleased that I continue to inspire new volunteers! I can’t imagine my life without the Gardens of Alcatraz. Unlike the prisoners who only wanted to escape, Alcatraz is my grounding place where I can go to escape. One of the former prisoner gardeners spoke of the hillsides being a refuge, the work a release. I know what he meant. The Gardens of Alcatraz will always be my refuge.